A multidimensional cosmological model with scalar and form fields [1–4] is studied. An exact S-brane solution (either electric or magnetic) in a model with l scalar fields and one antisymmetric form of rank m ≥ 2 is considered. This solution is defined on a product manifold containing n Ricci-flat factor spaces M 1, ..., M n . In the case where the kinetic term for scalar fields is positive-definite, we have singled out a special solution governed by the function cosh. It is shown that this special solution has Kasnerlike asymptotics in the limits τ → +0 and τ → +∞, where τ is the synchronous time variable. A relation between two sets of Kasner parameters α ∞ and α 0 is found. This relation, called a “scattering law” (SL), coincides with the “collision law” (CL) obtained previously in  in the context of a billiard description of S-brane solutions near the singularity. A geometric sense of the SL is clarified: it is shown that the SL transformation is a map of a “shadow” part of the Kasner sphere S N−2 (N = n + l) onto the “illuminated” part. This map is just a (generalized) inversion with respect to a point ν located outside the Kasner sphere S N−2. The shadow and illuminated parts of the Kasner sphere are defined with respect to a pointlike source of light located at ν. 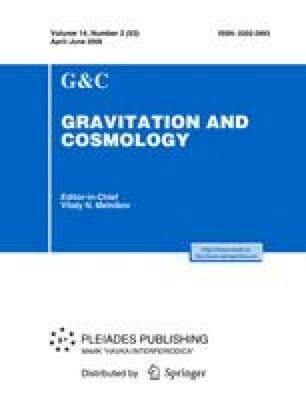 Explicit formulae for SL transformations corresponding to SM2- and SM5-brane solutions in 11-dimensional supergravity are presented.